Australian Football in Vanuatu has been taking baby steps for a couple of years – however, over the last 12-18 months momentum has increased and the newly incorporated AFL Vanuatu is sending 5 young boys to Tonga to join the All Stars squad in the Oceania Under 16s tournament starting next week. AFL Vanuatu has grown on the efforts of some dedicated individuals such as Justin Johnson and more recently Malcolm Thiel. Thiel is a 47 year old Adelaide ‘native’ who (in July 2009) moved his family (wife and 4 daughters) to Vanuatu. Via involvement at a local high school, he was able to become involved in Auskick clinics at the school. This was enough to re-ignite the footy passion. Thiel was able to start up another Auskick program in a local village and joined with some expats in a weekly REC footy activity. Via the efforts in Vanuatu to meet AFL criteria, the AFL Vanuatu has become incorporated, and the goal now is to establish two permanent teams initially, so as to develop competitive games. Mal has since returned to Australia (where he has a trucking business in Adelaide) but he continues to return about every month to Port Vila to continue his volunteer work at the local high school and as part of the AFL Vanuatu committee, he has an assistant coaching role. 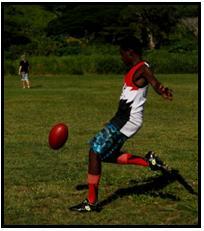 For the upcoming Oceania Cup in Tonga, AFL Vanuatu has been raising funds (about $7000) to send 5 lads to Tonga. Fund raising has been undertaken in Adelaide, as well, two local sponsors, Van Corp Construction and Traders Nightclub have assisted. The 5 lads are pictured below, from left to right, Charlie, Jonathon, Kilip, Robert and Robin. Mal will travel with the team to Tonga. I find it exciting to help offer these boys an unthought-of opportunity to experience genuine AFL games as well to broaden their exposure outside their villages. These boys live in jungle villages and so far have had such limited exposure to the game, yet they play with breath-taking skill and technique. Most walk 10 kilometres or take a 50-vatu bus ride (approx 50cents) to come to training and games. When they don’t turn up it is because they don’t have the money. Going to Tonga is important on a number of levels, apart from what it represents for these young men. While AFL Vanuatu might be in its infancy, this is an opportunity to demonstrate its serious intent, and that it has the potential to grow rapidly and the growth is led in a consolidated manner. One of the young boys, Robert, is only 14 years old. He has struggled every week to earn his bus fare to get to training. He sells coconuts on the side of the road to get $1.50 together so he can train. As his coach pointed out to me, selling coconuts to people in Vanuatu is a lot like trying to sell ice to an Eskimo! It will be the first time overseas for any of the boys. On behalf of WFN and our readers, I’d like to wish the boys all the best. With the Solomon Islands ‘graduating’ to sending their first full team to this tournament, hopefully within a couple of years we might see a full Vanuatu squad attending a future Oceania Cup. Obviously all this costs money, and time, and effort. Anyone able to assist can be put in contact with AFL Vanuatu via WFN.